What you need to know about the air conditioning in your car. An estimate 10% of Air-Con gas is lost from your car conditioning system every year. 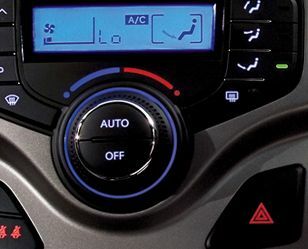 Today over 2/3 of vehicles are fitted with air conditining and climate control systems as standard. Many of us are familiar with using air-con in the summer to cool us down and in the winter to keep the air dry, but not many of us are aware that like other parts of the car, the air-conditioning system also needs regular attention to make sure it is working efficiently. As around 10% of gas is lost every year from the air-con system, meaning that it may not work as well as it should. This is why car manufacturers recommend the air-con system is recharged/serviced with gas and lubricant every 2 years. This service is not part of routine vehicle servicing, so if it has been more than 2 years since your car's last recharge, it may benefit from an air-con recharge service. We can also include a system de-bug to clear bacterial build up from within the system, which will remove unpleasant odours. # - if the Air Conditioning system is less than half full, a small surcharge of £10.00 will be applied to cover the cost of the extra gas used to fill the system as well us leak detection check. This can only be established once the air conditioning service has been completed and a print-out from the air conditioning machined is available. 1. Call to book your AC Recharge & Service. 2. Connect AC equipment to your car. 4. Old gas and oil drained. 5. Vaccum check for leaks. 6. Fill with new gas and oil. The Air Con Recharge & Service will take approximately 1 hour to be completed. Occasionally, the air con cannot be recharged or it may not work. This will require further investigation.